Maryport Inshore Rescue is an independent Lifeboat and Rescue Service to the Solway Firth and surrounding areas. The service is run 24 hours a day by a group of dedicated volunteers and works closely with the R.N.L.I., H.M. Coastguard and all other emergency services. When Storm Desmond first hit parts of Cumbria in December 2015, Maryport Inshore Rescue’s volunteers were among the first on the scene. They played a key role in rescuing people from their flooded homes in towns and cities across the county. A lot of the team’s equipment became damaged or contaminated by the flood water during the rescues. 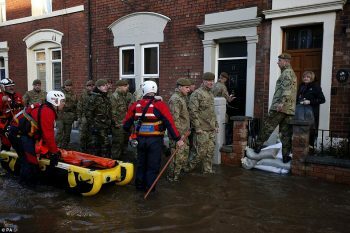 They were awarded a grant of £15,000 from the Cumbria Flood Recovery Appeal to replace specialist equipment such as wetsuits, helmets and radios.